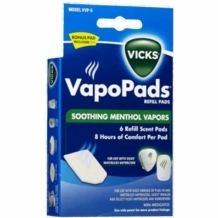 The Vicks Soothing Vapors Replacement Pads release a soothing menthol aroma that helps relieve cold and flu symptoms. It also works to alleviate other ailments, such as allergies, asthma, nasal congestion and excessive throat dryness. 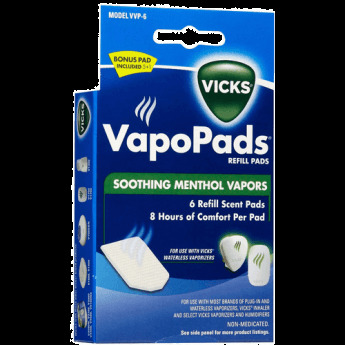 Vicks VapoPads, 6-pack, are design for use with some Vicks Waterless Vaporizer, Waterless Plug-In and Vicks Humidifier models. Each comforting pad lasts up to eight hours. The pads provide relief, as well as aromatherapy, for a pleasant atmosphere.